Political shortcuts can be tempting when time’s running out and the usual routes seem hopelessly gridlocked. But the roadmap of history shows that good governance travels a long, slow highway with no quick detours or easy off ramps. Therein lies a lesson for Democratic leaders at the state Capitol this year. They helped find a compromise to a polarizing problem — Washington’s lenient standard for police officers involved in lethal shootings. But they did it by taking a dangerous shortcut at the end of the 60-day session. It’s surely a lesson for this Editorial Board. We were so pleasantly surprised by the late-breaking agreement between police groups and victim advocates to eliminate the state’s “malice” shield that we supported their plan, not accounting for its fatal flaw. On further reflection, we believe House Bill 3003 sets bad precedent and could undermine the initiative powers that Washington’s constitution reserves for the people. That’s the argument raised by Tim Eyman, veteran initiative speculator and avid self-promoter. While his initiative factory spews a lot of anti-tax dreck not in the public interest, he gets things right from time to time. At least he did this time. Eyman filed suit against the state March 12, claiming the compromise adopted in the new law improperly abandons the deadly-force initiative that should be on the ballot in November. More than 350,000 people signed petitions for Initiative 940 and expected to vote on it. Instead, De-Escalate Washington, the advocacy group behind I-940, reached a deal with police groups to start the healing now rather than wait for a vote this fall. There’s much to like about HB 3003. Proving malice is an impossibly high threshold for prosecutors to meet, even when handling cases of reckless police conduct. But the new law has important safeguards for conscientious cops; it directs prosecutors reviewing police shootings to determine whether a reasonable officer in the same circumstance would believe deadly force is necessary to prevent harm or death. It also retains the initiative’s commitment to train officers in violence de-escalation and other skills. 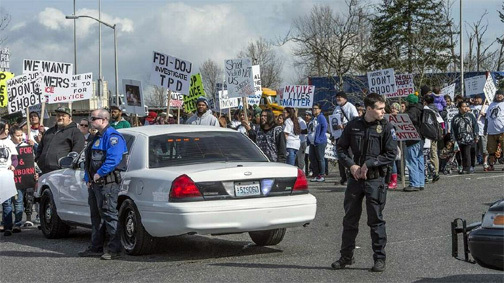 To grasp the need for such training, consider the Tacoma cop who lost a judgment in federal court last week after slamming a 15-year-old girl to the ground and using a Taser on her. Nationally, we see far too many unarmed individuals, often people of color, die at the hands of police — such as Stephon Clark, shot dead by Sacramento officers on March 18 while holding a cell phone. But short-circuiting Washington’s initiative process is a clear case of doing the wrong thing for the right reasons. The first half of what she said is right. The second half is breathtakingly wrong. Under Washington’s constitution, legislators had three options once I-940 was certified: (1) adopt it in full and let it become law; (2) let it go to voters without change; or (3) change it, put it on the ballot alongside the original version and let voters decide on both. The constitution does not offer a fourth option wherein legislators can tweak an initiative without giving voters a say. So they made their own Door No. 4 in a hasty DIY project. They passed the initiative as submitted, then immediately amended it. After walking through that door once, what’s to stop them from doing it again? Maybe next time they’ll sidestep the ballot for unworthy endeavors. Eyman wants a judge to order the state to put both I-940 and HB 3003 on the ballot, and we can’t disagree. It might confuse voters. It might delay healing. We pray it doesn’t help an irresponsible cop get away with a wrongful killing this year. But the shortcut the Legislature took, the one we initially supported, runs straight down a slippery slope into unconstitutional quicksand.